Today I met my friend Denise for lunch at Table Mesa in our town. If you live in NWA - you must eat here! SOOOOOOO good. I've wanted to go forever and I'm sad it's taken me this long. The guacamole was the best ever! I will be going a lot now. Denise and I worked together 7-8 years ago and have stayed friends. She had her miracle granddaugther with her today. Jadyn was born at 28 weeks almost a year ago and stayed almost 3 months in the NICU and now she is perfect. What a blessing to see her and Harper happy and eating out today! 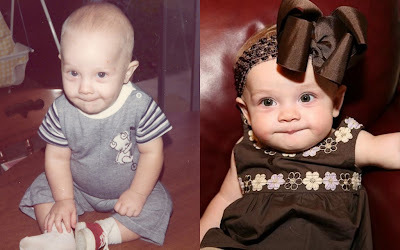 Scott on his first birthday and Harper at 7 months. I think the only difference is she has my round face and maybe my olive skin. And doing their mouths the same! ha! I'm pretty sure Scott could not be more thrilled than to have a little girl that looks just like him! ha! She is such a mess. Apparently traveling makes her hungry because last night when I fed her before bed she ate two big jars of baby food and a thing of yogurt and nursed and was begging for more. I was afraid she would explode. ha! This is our last quiet week before things get busy so we are trying to enjoy it. I'm so glad to have a few days of being at home this week. Next week things will start to get busy because I will be doing a women's Bible Study each week, we are going to join a MOPS group (Mothers of preschoolers) with some of our friends and we will have play group. I'm so excited about all the things we will be involved in but we will be two busy (but happy) girls!!! Isn't it funny how all little girls look just like their daddy's. 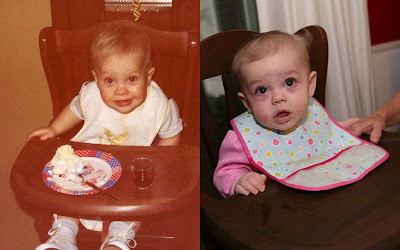 My daughter is the spitting image of her dad too! My sister and I just took a joint vacation to Gulf Shores with our families and we absolutely loved it! We toe enjoy eating out. We ate at some really good places. There was Lulu's and Sea and Suds, both are in gulf shores. We also drove to Pensacola and ate at the Melting Pot. (It was worth the drive but I don't recommend bringing the kids, we did and it was an experience within itself) Enjoy your trip! Just a quick note: Don't forget to bring baby powder with you to the beach. It is a life saver. If Harper gets any sand on her or in her suit, rub baby powder on her and the sand will fall off. No need to use the cold beach showers to get rid of the sand. Baby powder works wonders. I always bring it with me to the beach and the sand then stays at the beach and doesn't rub my child raw and fill my car with sand. I pray you have blessed time there. Kelly, LuLu's is fun fun! Also, try the Crab Trap across the bridge in FL! Harper is such a precious little girl, no matter who she looks like:) I recommend Lulu's and Louisiana Lagniappe in Orange Beach. I have also heard good things about Gratzi and Cosmo's Restaurant and Bar. Hope y'all have a great trip! I second the LuLu's and Seas and Suds!! If you want to drive to Pensacola you should eat at McGuires Irish Pub!!! They have the best hamburger you will ever put in your mouth!!! Yummy!! We just got back from Gulf Shores, the "HANG OUT" had really good fried pickles, the best I have ever had. We didn't eat out much with two kids but we did go on a dolphin cruise, which was long and hot, but neat to see dolphins so close. Oh and Penguin Eds on south school in fay, have fried pies too!! so yummy!!! Kelly, Ive been a follower for a while now, however I've never commented. We went to Gulf Shores this summer with my family. You should most definately eat at LuLu's. Lamerts is also a big Gulf Shores favorite. They toss rolls across the room to you. The portion as enormous an the food is homesyle cooking. I recommend the pot roast. Love your blog, your Harper is beautiful. My son, Brooks is just a few months ahead of her so I enjoy reading about her. Have fun planning your trip to the beach. Your blog is truly inspiring. LuLu's is a fun place if there is great weather. She sure does look like her daddy. My little Lucy looks like her daddy too. Doesn't it just make you smile! There is a little place called Hope's Cheesecake. They have every kind of cheesecake you could think of!! So good! I like the Snickers one! Louisiana Lagniappe is the best! I wish I would have discovered it sooner. Have lots of fun planning your trip! It will be a great time of year to go. This first one is really scary! I thought it was Harper at first. It's the same little smile. YEAH for MOPS. It's wonderful!! We try to go to Orange Beach every year! My all-time favorite is Wolf Bay Lodge! It used to be located way out in the middle of nowhere but that building burned and they are now located at Zeke's landing which is across from the island house Hotel! They have the BEST fried seafood! Very Fresh! Also if you go for lunch the prices are better and you get the awesome salad bar! You must try it!!! Hope this helps! I have never been to Gulf Shores but in Foley (about 20 min. north) is a restaurant called Lambert's Cafe - true southern cooking that you would LOVE!!! They throw, yes I said throw you hot rolls and come around with sides at no extra cost! The sides include good o'le southern cooking like- Fried Potatoes & Onions, Macaroni & Tomatoes, Black-Eyed Peas, Fried Okra, Hot Rolls & Sorghum. They also serve apple butter,, honey and of course butter with there rolls. There is also a outlet mall near the restaurant too. I live in Pensacola, if you want a good seafood restaurant, there is one on Pensacola beach called Flounders. My husband and I go there every year for our anniversary. Its a good drive from Gulf Shores and I am sure there are good seafood restaurants out there too. Too check out lambert's cafe online go to www.throwedrolls.com. I know you would love it - lots of activity too that Harper will love!!! I grew up in Gulf Shores and 2 places that the locals love to eat (and are the best in my opinion) are Wolf Bay Lodge and The Original Oyster House. Wolf Bay Lodge is in a temporary building at Zeke's landing (the original burned a few months back and they are rebuilding it). It is absolutely the BEST FRIED SEAFOOD in Gulf Shores/Orange Beach. If you like oysters, I suggest the Oyster House as well. I hope you have a great trip! Docs Seafood Shack in Gulf Shores has THE BEST fried shrimp I've ever had. It is so fresh and not greasy at all. It's a total hole-in-the-wall, but it's where the locals go and has such great food. My son is the spitting image of my son and my daughter is of me. Glad you are going to join a MOPS group! I love my group! I am with my 2nd one. It is a great way to connect with other moms especially for me since my husband is in the Army and we move. Lulu's is fun, (right by the intercoastal waterway bridge)but go early because they fill up fast - say 4:00/5:00ish. Live music starts at 6:00 there. Mikee's in GS is a great place to eat. Desoto's is really good. Cosmo's is good too. And my all time favorite is Oyster House! mmmmm good. You are making me want to go back, we were there in July. HAVE A BLAST! She does look like him a lot...but I actually think she is a mix of you and Scott. I remember some baby pictures either you or your mom put on here of you....and she favored you a lot too! She is precious no matter WHO she looks like! I have Sept. 17 on my calendar to pray with you! Sorry, haven't been to your vacation spot. But have a fabulous time! She DOES look just like her Daddy! Too cute! If you go, there is a really good dish called the "Beef tornadoes" or something like that. It's two beef medallions topped with a FRIED CHEESE GRIT patty, a scallop, and something else & a sauce---who knows, but it is REALLY GOOD..and HUGE! I hope y'all have a safe trip and such a good time!! We also enjoy going out to eat somewhere good each night we are at the beach. Some of our favorites are Lulu's, Louisiana Lagniappe, Bubba's, and The Crab Trap. There is also a new place that we tried this summer called Cobalt. It is in Peridido right when you cross over the bridge on the left. It is right beside the Caribe, which is a fabulous place to stay by the way! Dine outside if you can becuase the late evening view is beautiful there! The bbq shrimp and the grouper were delicious there! We are going back down in Septmeber and I can't wait! I love Orange Beach! You must try Lulu's - the atmosphere is too fun! And I know it doesn't sound very glamorous (and it's not), but Bubba's is a great place to eat. Louisiana Lagniappe is also good...and the Original Oyster House...and Mikee's (it's a hole-in-the-wall, but very good). I could go on for days! Hi, I have been reading your blog for quite a while. I don't know if I have ever commented though. I have been going to gulf shores/orange beach every summer for about 8 or 9 years now. Here are some of our fav's. Cobalt - this is a new place...I have heard great things about it...kind of $$$ though. Cosmo's - great food...have some good sushi as well if you like sushi. Hope's Cheesecake - WONDERFUL cheesecake!! Lillian's pizza - great italian food at the beach...wonderful pizzas! they are at perdido key but will deliver. Hey Kelly, we are leaving for Gulf Shores NEXT week (Sept 3.) and I personally can not WAIT to go out to eat. I recommend the Crab Trap across the bridge in Perdido, FL. They have a kids playground. Also, Lulu's as everyone has mentioned is tons of fun but they really only specialize in your hamburgers, etc. So if your wanting something different than a cheeseburger in paradise! The Hangout is great as well and alot of fun. And then there is a place called the Back Porch. Its off in the woods but they have the best seafood around. Lambert's is also great, but the wait is ridiculous!!! Kelly, I live in Mobile (about an hour north of Gulf Shores)- eat at Lambert's and Lulu's they are both great and very family friendly. Also if you have time go to the outlets in Foley (about 30 min from the beach), they have great kids stores and you can usually find awesome deals. I LOVE your blog, and Harper's huge bows! She is a cutie! Have fun!!!! I have never left a message for you before, but I used to live just norht of Gulf Shores and you must, must, must go to Lamberts... Home of the Throwed Rolls... it is in Foley, just north of Gulf Shores on Hiway 59... GREAT FRIED OKRA AND CHICKEN!!!!! You cannot miss it... so much fun! Also, I have been reading your blog since you had Harper... I was so very worried when there was a chance she would have to be on ECMO... we lost our daughter in 2004. She was born with hydrops caused by a virus and experience pulmonary hypertension, she was sent on life flight to Shands in Gainesville, FL where she was put on ECMO. I hate to see for anyone to come to that point and I cried with joy when Harper made a wonderful recovery. Funny thing, if my youngest had been a girl, we were going to name her Harper after a great uncle of mine. Instead, we have a Grant... oh and a Grady and a Todd... and Esme watching us from above. I would love for you to check out our blot at www.harristripletrouble.blogspot.com. Have an amazing trip and do not miss Lamberts! Harper is the spitting image of her Daddy! We were in Gulf Shores the week of July 27 and we ate at Ribs and Reds, we had Godfather's Pizza one night and we ate at Tacky Jack's twice in Fort Morgan. Once for dinner and once for breakfast. Also, if you decide to go to to Dauphin Island we ate lunch at the Lighthouse Bakery and it was fantastic. I hope that you all have a fun and safe trip. We have a condo in Gulf Shores, and being such a "foodie", I've tried several places there. By far, the best is Cosmo's!!! I have been following your blog for a while now. I love to see what you have to share with your readers each day. I am back at school so things on my blog have slowed down quiet a bit! I try though. As far as Orange Beach goes, my family has been going for the last 22 years. We LOVE the beach. Our favorite places to eat are Louisiana Langiappe, Cosmos is a new place we went this year, Jenny Lane at the Wharf, Tacky Jacks is a fun casual place. The breakfast there is great! Hope these suggestions help. We have a lot more if you need any more suggestions. Hands down our favorite in Gulf Shores is Gulf Shores Steamer. It's all steamed seafood...nothing fried and very yummy! It's very family friendly...our little boy through a fit and no one even seemed to notice! You can eat outside or inside and if you like crablegs...this is your place! It's right off the strip in Gulf Shores. I've only been to Gulf Shores once, but you MUST eat at Lambert's! Such yummy home cookin' and rolls! We are planning a trip for next weekend (Sept 3-7). We went last year and enjoyed LuLu's. We have an 22 month old, so last year she was right around Harper's age. She did great at LuLu's, of course the music and people she enjoyed most. I am enjoying reading the comments and getting some ideas too! Everytime we go to Gulf Shores we ALWAYS eat at LULU's and they have the best food and their crab claws are wonderful, great family place. They have a play area for the kids. It's wonderful. Lambert's is also great, the home of the throwing rolls. The food is great too. I love the pics of your husband and Harper and how much she looks like her dad when he was a baby, too cute. You shold frame those. I've been reading your blog for about a year now but just now commenting for the first time! I'm from Daphne (Just north of G.S. you'll probably pass it if your driving down I-10). I would def recommend Lamberts they have the best southern food. They go around with a huge bowl of fried okra and dump it on your plate! I see alot of people are recommending Lulu's. It has great atmosphere and is right on the water but I find them rather pricey and the menu isn't that great. Lillians Pizza in Perdido is awsome. I would recommend their chicken ranch pizza. The Crab Trap in Perdido. If you want to take a trip to Pensacola try Mcguires Irish Pub (that place is a blast. They have a moose in the middle of the resturant!) Also, if you are looking for good seafood I would recommend Peg leg Petes. They have really good grouper sandwiches. For great seafood with way more than you can eat go to Desoto's. It is super yummy and big portions. I live in Mobile and we go down that way quite a bit! I second LuLu's and Lamberts. You are coming during a pretty off season, so the waits shouldn't be too bad, especially if its a weekday. Friday and Saturdays, I would get there either for lunch or an early dinner to avoid the long wait. LuLu's has great fish tacos! I also saw mentioned The Hangout. GO! Harper will love all the action. My Caedmon had a blast with everything going on! She does look just like her daddy! 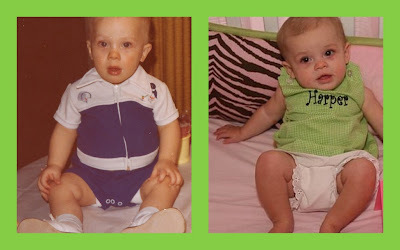 We did that this past week while we went through pictures at my granparent's house and Brody looks just like my dad's baby pics. It's so weird! We are doing MOPS at our church and bible study, too, as well as Mother's Day Out, so we are about to get busy but I like that it will be a good routine each week. My favorite place in Gulf Shores is Grazzis. (I think I spelled that right.) It's small, but soooooo good! I live in the area...LuLu's and Lambert's are both really good. We frequent the area practically every weekend :) There are also a ton of really good place's over here in Pensacola as well. We go to the beach a lot since we live in Mobile, we are actually going labor day weekend. I see all the regular places have been mentioned, we recently tried Cobalt and it is SO good!! It's so pretty at night, great atmosphere! I agree with the LuLu's comment. I have also heard King Neptune is good. We ate at Big O's and it was YUMMY and fairly decently priced, especially considering the amount of food you get. LULU's ..... and you MUST buy her cookbook while you are there! It is more than a cookbook, it is a great read about her family and family history! Don't miss a trip to LuLu's! King Neptune's is an amazing restaurant. I saw it on the food network as a little known place that is delicious. Look it up. You would LOVE it. Hi Kelly! We love Sea n Suds, Lamberts, Lulus, and DeSotos. Eating at each of those is a MUST for us. ALso....you need to try Hope's Cheesecake...it's awesome! Hope you have fun! you HAVE to eat at lamberts in foley if you haven't been there before! one of the funnest restaurants there are!! Kelly - Try the Giggling Grouper...or DeSoto's off of West Beach Blvd is great at lunch...prices are much cheaper at lunch & the food is good & consistant. You are going to love it...we are going Labor Day weekend. Wish it was the same as you & we could meet. I read back on your blog today about the birth of Harper & your journey there after. I am amazed. What a little miracle she is! Praise God! Wow, that high chair picture is incredible. What resemblence to her Daddy! I still see part of you in her too Kelly. A sweet mix of both, have fun at your MOPS group! Hi Kelly! I'm putting in my two-cents-worth about Lulu's. It is our family's favorite: the food, the music, and the shopping! Like Lambert's, Lulu's requires a wait. But it is worth it! And I've wanted to comment for ages about how adorable Harper's little smile is. I just love how her eyes and whole face light up in her smile! So sweet. The Lord has blessed you greatly! We just got back from our blessing of a vacation in Gulf Shores (thanks to all my amazing friends!!!!) and you simply MUST go to Lulu's but you have to CALL AHEAD... by 7 or 8 pm they will be closed to incoming traffic for the evening. Another place to go is the Oyster House. My hubby LOVES it. If you are over near Mobile you could check out Saucy Q's BBQ too!!! MMmmmmm good!! The Original Oyster House by Souviner City and Lambert's in Foley. heck, everything tastes better at the beach! We were in Gulf Shores this weekend and even my Whopper Jr. tasted better. Wolf Bay Lodge for sure! Lulu's too! Lulu is Jimmy Buffet's sister! He has even been known to stop in! Have a great trip! Ribs & Reds has great food and they're located down by the main T on the opposite side of the strip from the beach! So good! My aunt with a 2yo & 6yo also really enjoyed taking her kids to The hangout...I don't know if harper would really be able to enjoy it yet, but I think even my aunt & uncle enjoyed it! I looked JUST like my Daddy when I was a baby. But now I look a lot more like my Mom. So Harper could still end up to be a min-Kelly. Although the Scott/Harper comparison is striking! That guacamole looked to die for! Harper is such a cutie and she does look just like Scott. How sweet. I am a young 20 something but I really enjoying reading your blog. Maybe it's her eyes are like yours...? I see some likeness between you and her but she is totally a daddy's girl. My youngest is a daddy mini-me. I've never been to Gulf Shores, but I've seen friends mention that they always eat at Sea and Suds. And I saw someone mention Lambert's to you. We have one here, and it's wonderful. The only bad thing is that they don't do reservations and the wait is sometimes very long. In addition to the sides that they come around with, that are all you can eat, one thing they don't advertise is that all the entrees are all you can eat, too!! You can have all the chicken, steak, fried catfish, or whatever that you order. I love their chicken fried steak and fried catfish. Plus, their rolls are wonderful! REading you sweet post reminded me of the wonderful bible studies and MOPS groups I joined when my little ones were babies. Oh the fun with other moms... what in the world would get your though those years if it wasn't for the support of girlfriends? You need to go to Lulu's! It's Jimmy Buffet's sister's restaurant, and the atmosphere is so fun! Outside while you wait there is sand and games to play, and when we went they had a band! Hi Kelly! I just got married in April in Gulf Shores! If you don't mind making the drive out there, I highly recommend the restaurant at The Beach Club out on Fort Morgan Road. it's very yummy and you can dine outdoors with a beautiful view of the Gulf! Another fave restaurant is Calypso Joe's in Orange Beach. We also ate at Rafter's Restaurant & Sports Bar and it was really reasonably priced for lunch and had great fried pickles! And of course you can't forget Mikee's! We did our rehearsal dinner at The Hangout -- that was a lot of fun! Yeah for MOPS! I think you will be so glad you joined a group and I know they will be blessed to have you as well. As for a place to eat, drive to Foley and dig in at Lambert's. I have never been to that location, but have been to the original in Sikeston MO since moving to St Louis. Bring your appetite though! We rent a house on Ft Morgan but have not been in a few years, so I don't know what else might be around there. Both my girls started looking like my husband but now everybody says they look just like me. So you still have a chance! :) Thanks for the Table Mesa suggestion - my Mom loves loves Mexican food and they live in SW Missouri so Bentonville is an easy day out for them. They go there all the time, but I don't know if they have tried Table Mesa yet. I emailed them the website! Good luck on the bible stufy and MOPS - you will love both and it will make you a better Mom - even if it is a little work at first to get out of the house and go. love the bows, she is adorable! I hope to have a little girl someday so I can doll her up in bows too! Restaurants...Doc's, Lulu's (LONG wait but fun wait), The Crab Shack (there are a few of them)...they're ALL delicious! Well.. I'd have to agree with quite a few other's about LuLu's! Gosh.. I''m so jealous.. My home town is about 40 minutes from there and we use to spend every summer there.. Have a GREAT TRIP! Our family has been going to Gulf Shores for about 6 years now. The Original Oyster House is a must, The Hangout was good. If you like country cooking you have to go to Lambert's. It's in Foley. For ice cream, Scoops is the best!! Have fun! Eating at fun restaurants is probably one of my favorite things to do! Let anyone you know, if they want a FREE blog makeover, check out onefineblogdesign.blogspot.com! :) Happy Monday, Kelly! Kelly, I think Harper is a mix of the best of both of you. Scott's eye, your mouth. A real doll. Have fun on your vacation. I've never been to Gulf Shores, but it sounds great from all the comments. ps. Does Dawson get to go to the beach? Cozmo's is super good, but pricey and long wait. If you go, go early to avoid the crowd! If you love shrimp, you MUST go to Doc's Seafood and have some royal red shrimp, you can only get these in Gulf Shores/Orange Beach. I would suggest the Doc's in Orange Beach rather than their location in Gulf Shores, just a personal preference. Doc's also has fabulous oysters, po-boys and gumbo! Yum! Hey Kelly! I love your blog! Your baby is precious! As for restaurants in Gulf Shores/Orange Beach, LuLu's is great if you want to go to a restaurant for the atmosphere-definitely not the best food! There is also a huge wait. IMO a poboy at Doc's is 100 times better! Other local favs: Oyster House, Wolf Bay Lodge, Calypso's, Mangos, Live Bait (during daytime), DeSoto's, Tacky Jacks, Grazi's. Have a great time! My husband and I went to Orange Beach last week and we ate at Ribs & Reds and it is hands down our favorite place. Oh my goodness - she and Scott could be twins! Dont go to Gulf Shores much, but loved LuLus by the intercostal water way and a little hole in the wall called Docs. Hope you have a great time. Harper looks like both of you and she is absolutely beautiful.! Wow, she does look like her daddy! We have been to Orange Beach for the last 2 years and we love The Shrimp Basket. For fast pizza delivery you can't beat Dominos in Orange Beach. Have a fun trip. Oh, you will love MOPS, I still hangout with my MOPS buddies. You must eat at Lulu's. It's one of my favorite restaurants. Have fun! Lamberts is really good... order something lite though.. they come around with big bowls of other things and put on your plate. athey do throw rolls so it was entertaining to the kids and baby we had with us. Also I love going to the outlets and there is some in Folley sp? not sure I spelled that right ! We have family right outside Gulf Shores in Fort Morgan so we go down there very regularly. The best seafood place down there (in our opinion, anyway!) is Desoto's Seafood Kitchen. It's more of a local place rather than a tourist spot, but it still fills up fast! I grew up going to Orange Beach and would always eat at Wolf Bay Lodge. We all loved it! I recently went back to Orange Beach with my own family and we went to Bahama Bob's. It was DELICIOUS!! it's right on the beach in Gulf Shores with a very laid back atmosphere. We were there with our 2 1/2 year old and our friends had a 12 month old. We loved that the place was great for them as well. I love your blog! It's so encouraging! The "Lagniappe" is fabulous and my Husband likes "The Point" There are cute baby stores at the Wharf you should check out! i didn't read all the comments so i don't know if anyone has suggested this but you have to go to lulu's. it is def a tourist place but locals love it too! Wolf Bay Lodge with not disappoint!!! Harper looks sooooo much like Scott and just gets cuter everyday!!! I've only been to Gulf Shores a couple of times & YES, Lulu's is a must if you haven't been there. The food is good too. We're going to Seagrove Beach in about 3 weeks, too bad you won't be down that way, would love to meet you. :) I know a lot more restaurants there too. If you come through B'ham, wave at me! You should definitely eat at Lambert's. There is a really long wait there usually, but it's definitely worth it! I love seeing the comparison pictures. She does look like Scott!!! Darling! I haven't read all the comments here, so I'm not sure if someone has suggested this or not but try the Shrimp Basket. There is one in Perdido and I think another one over in Orange Beach. It is WONDERFUL! Go there for anything fried. DOCS! its a local little joint. Not the one on the main strip. The one that is out kinda by the wharf. Look it up- its worth the trip. CHEAP and CASUAL but YUMMMMMMMY!! *Tacky Jacks (they have great dinner and a great breakfast but it may only be served on the weekend). Hi Kelly! I've been reading your blog for awhile now! Harper is adorable! She's a little over two months older than my daughter Lyla. I alwys enjoy reading and seeing what I have to expect! Anywho, I live close to Orange Beach (I live in Pensacola. FL) and my husband is always telling me how good Zeke's is out there! I'm not 100% sure it's still open, but my hubby sure loves it! Have a fun and safe trip! I am so glad to hear you are joining MOPS. I love my MOPS group in Maryland. I have made the best of friends. Enjoy your beach vacation! Don't know if anyone else has said this but The Shrimp Basket is our family's favorite. It is a whole in the wall but they have the best food. Blackened shrimp basket is my favorite and they have shrimp slaw which is to die for! Have fun on the trip! these are the musts! i eat at these 3 every year! lulu's go about 4:30 and you may not have to wait forever. really fun for kids. original oyster house (or bar) i can't remember - awesome salad bar with every order! I have heard that Ribs & Reds is a good place. I live close so honk your horn when you pass the Exit 38 on I-10 in Baldwin County! I have never commented on your blog, but if you love seafood then The Shrimp Basket is the best. We were just in Panama City and talking about how we missed going to there. We used to go to Pensacola every summer to visit family and that was a must stop (they have 2 locations). It's a hole in the wall, but I've found those can be the best. Plus, it's about 5 minutes from the outlet mall. Eat at Steamers in Gulf shores...we usually eat there more than once during our stay!!! our fave! We always liked the Gulf Shores Steamer there. Have fun! Oh WOW!! I missed our family's annual trip to Gulf Shores but I wanted to put mt 2 cents worth in. Lulu's, Lambert's (Home of the thrown rolls), Shrimp Basket, Sea 'n Suds (Great casual bathing suit place! ), The Point AND Scoops. Scoops is an awesome ice cream joint (yummy!). Have fun! You will love MOPS...we are about to start our second year with our MOPS group and it is fabulous! I agree with everyone else and recommend Lulu's! Hey, I am from Mobile, so Gulf Shores is really close. You HAVE to eat at Guy Harvey's. It is the best food. There is also a little boutique you need to check out. It's Oh La La's and it's at The Wharf (same as Guy Harvey's.) When I went there they had silicone baking pans for most of the SEC schools. I got a script A! Roll Tide. You are right... spitting image of her dad. BUT, she does have your fashion sense! We really like Jakes- it's a yummy steak place and Lambert's. You get a crazy amount of food at Lamberts, but it's sooooo good. Have fun! You'll love Louisiana Lagniappe. It is at San Roc Cay. They have a little sand area with a swing set and play area for the little ones. So, Harper might enjoy that. It has such a nice atmosphere and great view of the bay. Hope you all enjoy your vacation. Orange Beach is just wonderful! my hubs, ryan, and baby sofia have the same expressions too! isn't it weird how a cute boy can be such a beautiful girl face??? she's darling!!! Lulu's... fried green tomatoes :) my ALL time favorite in Gulf Shores! I am from Alabama, and feel like Gulf Shores is my 2nd home since we go several times a year! Everyone has already mentioned that you need to eat at Lulu's, and you must - so much fun and good food! Also, Lambert's is great for country style food. Another AWESOME place is Franco's - it's Italian food (which I know is a little odd to eat at the beach) and it is soooo good!! And, for a dessert you need to stop by Hope's Cheesecakes...it's a little hole in the wall place that specializes in cheesecakes that are incredible!! I hope y'all have a wonderful time!! This is a great time to go! My dad lives in Orange Beach and it is ABSOLUTELY one of my favorite places in the world. Two places that I HAVE to go to everytime I'm there are Tacky Jacks and Doc's. The onion rings and gumbo at Doc's are amazing! I see that I'm about commenter 116 so maybe you'll read this far down, but I only skimmed the first few and I have to stay, and will probably getted tomatoes thrown at me, but DO NOT WASTE YOUR TIME AT LULU'S. The wait is not near the worth. It's just regular food so you wait two plus hours basically for the name and location, but not really the food. I don't know what you are going to eat down there if you cannot eat seafood due to nursing but my family has owned a condo in Orange Beach for years and so that has been my home away from home. We tend ot eat at local places off the beaten path but here are a few of my favs: Doc's (the old one, not the new one in Gulf Shores), Cozmo's has great seafood and burgers, there is a great Italian place in Orange Beach but I can't think of the name, I saw some mention Sea N Suds and the Hangout-since OB and GS has been the ONLY place I've ever vactioned I don't recommended those places either, but the Oyster House is good. Tacky Jack's is good. Lousiana Langiape is really good, prob my #2 fav down there, and really nice. Mikie's is good. I know you don't want to braodcast to the world where ya'll are staying but I'd love to know. We owned at Regency Isle and now at Emerald Place. I hope ya'll have the bestest time ever and I know you will with that sweet baby girl. You have to go to the Warf and stroll around, they have some really nice botique like places and it's sort of out-doors like. And check out Tootie Green's Yellow Broom, it's a shop, if you have time, too. Please excuse my spelling, it's been a Monday alllll day long, I have a sick husband and a cranky baby. I am from Alabama and currently live in Mobile. The Hangout is a new restaurant that is lots of fun for the entire family. They have a really neat atmosphere and they dance a lot - fun place!! I think the best food is at Guy Harvey's at The Wharf! Excellent food!!! Hope you have a wonderful vacation!! Oh and I don't know how often you check out my blog, but I swear I tell my baby that if I had a dime for every time I heard "oh my, she is her daddy made over" I'd be able to quit work and stay home wiht the angel. We have total strangers stop us and comment about how much she looks like him. Even her hair line is just like his. It's so funny how stuff like that works out. And you are right, they walk around on cloud nine when they hear that. The Shrimp Basket~a little hole in the wall place a little past Turquoise Place on the left side of the road. The Hangout~outdoor eating with live music and it's right on the beach...very fun! My family just returned from vacation in Gulf Shores on Saturday. We loved The Shrimp Basket and the Gulf Island Grill. We also ate at LuLu's. The atmosphere there is great, but the food is not the best I've ever eaten. If/When you tire of seafood, try the Longhorn (if you can get past the name). It was wonderful! And, you must try their Chocolate Stampede. Best dessert ever! We ate at Cozmos last month and it was sooo good! It is on the same road as The Wharf, just a couple of miles East (I think). They had a BLT sushi roll and it was YUMMY! I am so glad you are going to Gulf Shores in a few weeks...we're going in 2 weeks and I'm getting some GREAT suggestions!!! :) I LOVE the onion rings (and I'm not an onion ring girl) at Doc's....so delicious!!! Be sure you go to Lulu's (I have a Lulu's t-shirt, and it always makes me smile during the cold, winter months!). Also Gulf Shores Steamer has great steamed food. We love Louisiana Lagniappe for date night. We have been going to Gulf Shores ever since my baby girl was born--9 years ago! It's a great place for families!! We go to Orange Beach every fall for a conference (I get paid to go...how great is that??). This past year, we ate at Bayside Grill for the first time. I was 12 weeks pregnant with twins, but I still managed to eat a grilled shrimp salad, and it was great. I can't wait to go back this year, with my babies! We also enjoy the Original Oyster House. Girl, Harper looks JUST like Scott. I didn't realize it until I saw these pictures. I know it makes him so proud! She is BEAUTIFUL I know that much! I wish I was planning a trip to the beach!!! Harper does look a lot like Scott! My little one is my hubby's mini-me as well! I grew up VERY close to Gulf Shores/Orange Beach and still go down there for day trips when I am visiting family. Sea N Suds and Docs have good seafood. They are nothing fancy, but they are good. Sea N Suds has a free cup of gumbo on their website that you can print out. Wolf Bay Lodge is very good. We used to go there all of the time. I did not realize that the original burned, but it sounds like they have moved to Zeke's which would be much more convenient. Cosmos and Louisiana Louisiana Lagniappe are also very good. Tacky Jacks is also fun. And the Oyster House is good for seafood-I actually love the blackened shrimp there. Lamberts is great if you need a break from seafood and need some homestyle country cooking. The outlets in Foley are great and The Wharf is also a neat new place to visit. I was going to include links to all of the above, but my computer is being super slow/difficult right now:( Hope you all have a great time down there! Although I live in AL, Destin is my beach of choice. When we go to Gulf Shores, I love Louisiana Lagniappe (my mouth is watering right now thinking about the BBQ shrimp, Grouper A La Kevin, and hushpuppies delivered to your table instead of bread!) and the Original Oyster House! Have a great time at the beach! My daughter also looks a lot like her daddy, but she wears lot of big bows too! Yall have a great time at the beach and eat lots of great food!! If you like good 'ole southern cooking (and I know you do!! :) ) then you MUST go to Lambert's--Home of the throwed rolls!! You will NOT leave that place hungry! Visit the Wharf and check out some of the cool shops and ferris wheel. There are several good resturants there as well. If you go to Live Bait try the seafood nachos....ummmm! You have to go to LuLu's. She is Jimmy Buffet's sister. They have the best fried okra and onion rings! Also, go to the original oyster house. Both are our favorites! They are both on the highway before you hit the beach. LuLu's is at the marina on the left and the oyster house is a little closer to the beach on the right. The very best place to eat is called The Tin Top in Bon Secour. It's about 15 minutes from the beach. I get the steamer platter which is 1 lb of steamed snow crab legs and 1/2 lb of steamed shrimp. I used to live down there so I know what's good! I just returned from Orange Beach yesterday. We also like to eat out, and did so each night we were there. I have found a new favorite restaurant--Ginny Lane Bar & Grill. It's on the back side of The Wharf in Orange Beach! I had an INCREDIBLE blackened ribeye with wousterchire (i can't spell it right) butter on top-- HEAVENLY :) they also have live music on the weekends!! Another favorite of mine is Cobalt which is right next door to the Caribe Condos on the bay! I hope this helps! i wish you'd posted this last week! we just got back from orange beach yesterday! my favorite place to eat was Lulu's. their fried fish was awesome! I also LOVE Louisiana Lagniappe. We also got carryout from Franco's italian restaurant & it was VERY good! I was secretly hoping you were there while we were & we'd run into you guys out since i knew you were going soon! Oh my! Scott and Harper DO look alike!! But I still see you in her also. I say she is a good mix. When we were down their earlier this summer we ate at Tacky Jacks for the first time, it was really yummy. ORIGINAL OYSTER HOUSE is the BEST!! The service is SUPER SPEEDY...great when you have a little one!! Then you have to have some SCOOPS ice cream!! Kelly, we live in Mobile, AL which is only about an hour or so from gulf shore/orange beach. We go to orange beach very very often in the summer months, and have eaten at every place down there! :) The hands down "locals" favorite would be Tin Top, just ask someone at your condo/hotel to give you directions. All the locals know where it is. It is kinda off the beaten path, but I promise it is SO good! Some of my favorites to eat there are... oysters tin top, sauteed crab claws, seared tuna steak, any of there steaks, and well, i guess just about anything there! You cannot go wrong at Tin Top! Also, Doc's is great fried food. Louisiana Lagniappe is also great. Gratzi is great Italian food. And well, just email me if you want to know any more specifics about these or any restaurants there. I hope yall have a great trip! You need to travel up to Fairhope, AL..about 45 minutes from Gulf Shores if you get a chance. It might be too far if you stay at Orange Beach. But Fairhope is a LOVELY town, like some place you think there is no more of. If you go to the bay in Fairhope, you will end up at Point Clear and there is a wonderful Marriot there called "The Grand". It is an old but beautiful hotel and grounds where the bay the and gulf meet. They have a GRAND Sunday brunch. Truly wonderful and relaxing and the view is awesome. Think you would love Fairhope! One of my favorite places!! Harper is just precious! I so enjoy reading your blog, and watching Harper grow. I appreciate your witness and testimony to the Christian faith. Coming from a girl that was raised in South Alabama, my restaurant suggestion is most definitely The Original Oyster House. Lulu's is great for the atmosphere, but expect a long wait! Lamberts, Lamberts, LAMBERTS!! I want to go right NOW!! ~enjoy your trip, can't wait to hear all about it! Doc's seafood , Tacky Jack's, The hang out, scoops is a must ! Yummy little Ice cream place on 59! My girls enjoys a choc covered frozen banana!! Also...bit of advice ...if you go on a dolphin cruise it's best not to go early in the a.m. they are eating and do not want to play!!! You're coming to my hood...yay! The restaurant recommendations are as good as it gets...can't go wrong with the seafood joints. Glad to hear also that Wolf Bay is still operating in spite of losing their building a few months ago. I wasn't sure what had become of them. I am such a guacomole fan! If I ever come down there I will go to that place. Harper is adorable. Have a great week! LuLu's and Louisianna Lagnappe!!! LOVE THEM!! We like LuLu's and the Warf in Orange Beach is a really fun place to walk around. There are some neat shops to look around in and the ferris wheel is really fun. I am sure there are probably some yummy places to eat there as well. You must pack an inflatable baby pool! It is so great to have. You can fill it with a little bit of ocean water, set it next to your set up/beach chair, and then Harper can play in the water without having to be in the ocean at all times!! Oh, and don't bother bringing it home. Too much sand and you can never fold it up as tiny as it comes in the package. Have so much fun!! Can't wait for the pics. I am not a fan of seafood, so I may not really know the best Gulf Shores eateries...but here are my votes. I like The Hangout for lunch (haven't done dinner there). Lamberts is another favorite of mine...the food just never stops coming! I'm sure true foodies would cringe at the thought of eating there, but I love it. Hey it's Sonic Courtney again! You know I live in Alabama. The best restaurant BY FAR in Orange Beach is Cosmos!!!! We make it a point to eat there once or three times a beach trip! There is indoor dining, but also a deck usually with a guy playing acoustic guitar and singing. The atmosphere is fabulous, but the food is EVEN BETTER!!! Oh does Miss Harper ever look like her daddy! So sweet!! We went to Perdido-not to far from where you will be staying. I love Lillian-they have the best spicy crabmeat pizza. Also crab trap. And in Alabama they have Lamberts which is just like the one in Missouri. Right beside Lamberts is the OUTLET MALL! I'm new to your blog but I'm an Arkansas mommy too. WoooPigSooie!!!!! Lunch- LuLu's is okay, but Guy Harvey's and Live Bait (both at The Wharf) are MUCH better! If you must go to LuLu's I recommend the crab melt sandwich. Dinner - Cosmo's, Cobalt, or Geno's. All 3 are superb. So are Ginny Lane and Villagio Grill (both at The Wharf). I would definitely skip the Sea-n-Suds/Shrimp Basket type places. Those places are too greasy for me. Lambert's (AMAZING fried okra) and Gulf Shores Steamer & Grill (wonderfully steamed seafood) is a must!!! Oh, boy!! She DOES look like Scott! I've been a long time stalker, but have not commented a lot. But recommendations in Gulf Shores I could go all day! We live about 3.5 hours north, and we go all of the time. We've even taken a few day trips to just lay out and eat dinner on Saturdays. I didn't read all of the comments but, I will still give my full opinions. :) I don't know if you've booked your place yet, but try VRBO.com It's where the owners rent out their own places so it is sooooo much cheaper instead of paying the fees the bigger names charge. A group of 8 of my coworkers are leaving on 9/21 staying 3 nights in a 3br/3ba condo and its less than 200/night after all of the cleaning and taxes are added. Definitely try Big O's for breakfast! They have the BEST homemade cinnamon rolls. They're huge! Bahama Bob's is my all time favorite restaurant! It's on the beach and they have a great variety of items. My fave is the crawfish po boy. Lulu's is of course amazing! Crab melt is oh so yummy. They even sell a cookbook with most of the recipes. We have cooked several items from it and they tasted just like the restaurant! Wolf Bay @ Zeke's Landing is really good too! It's on a marina and we sat out on the porch and watched the boats come in from deep sea fishing. Of course you should go shopping at the outlets in Foley and eat at Lambert's. Best home cooking with all of the pass arounds. Just don't go on your last day, you will have plenty of leftovers! Harper looks just like her dad. The facial expressions are just the same. She is a beauty. Have a great day. Yes Lamberts is so worth the drive to Foley. We ate there twice while we were there in May. Foley is also where the outlets are. We also drove to Pensacola for Peg Leg Pete's. Someone already mentioned it but the Oyster House is awesome you have to get the peanut butter chocolate chip pie and one piece is enough to share...it's so good!! The Original Oyster House is my favorite however I did like Lulus when we went at lunch. Yes,Harper is for sure made from her daddy's mold. Just got back from Orange Beach last night and can't wait to go back Labor Day weekend. Docs Seafood has the best fried shrimp and gumbo I've ever eaten. Ginny Lane (at The Wharf) has unbelievable Shrimp & Grits. The Wharf has something like 15 restaurants. It's a great place to spend an afternoon browsing the shops then have dinner and/or a movie. And I'm gonna add my 2cents about LuLu's. The atmostphere is great, the foods okay, and the wait is forever! Go early for appetizers and enjoy dinner elsewhere. I live in NWA and we just got back from Orange Beach (took my 9 mth daughter and 2 1/2 year old son). We love Doc's Seafood and the Hang Out (VERY kid friendly). We did find our favorite thing was Lartigue's Seafood Market in Orange Beach. You can get fresh everything (oysters, shrimp, fish, crab claws) and cook it yourself. Or, you can have them "cook" it for you. Their steamed shrimp was amazing and they have this amazing crab dip (cream cheese goodness). One tip that I did is buy a "cheap" baby pool at the Dollar Store. I put a towel in the bottom of it and parked it under an umbrella. It was the perfect "sand free" zone for Conlee (my 9 mth old) to play in. She is just the spit of Scott, isn't she? But with a definite dash of Kelly in there too! Harper definitely has your cute cheeks! What a beautiful blend. Looking at these pictures and thinking of this exact topic makes me really hope and pray that our three frozen embryos thaw and that our surrogate gets pregnant. People take for granted the joy that lies in being able to look at your child and see your mate. I know there are joys in adoption and can speak from experience, but there is such a connection when you look at your child and see what the love you two have for one another has created (thru Christ). What a blessing! So, maybe she does look like Scott! But, I'm telling you what, she looks like you too! We have a house in Gulf Shores and are down there quite frequently...Louisiana Lagniappe is a must! Sea-n-Suds and Fat Backs are pretty good too! Have a fun trip! In Gulf Shores, for seafood, the Shrimp Basket and the Original Oyster are two of the best. Lulu's is lots of fun but to me, not the best food. We really love Cafe Grazzi in San Roc Cay in Orange Beach. It's Italian food and they bring you bread and mix up the olive oil and fresh roasted garlic to make a wonderful spread for the bread before your meal. It's faboulous. It's also on the water so you can watch the boats coming in from fishing and all of the huge fish. Lots of fun and wonderful food! Harper is certainly her Daddy's Daugther! I live in Alabama and have been going to Gulf Shores/Orange Beach every summer since I can remember. One of my favorites is the Original Oyster House, their seafood is awesome and they also have a HUGE salad bar. Lulu's is also good and alot of fun for kids. Their fried green tomato BLT is my fav. Another good local place for good seafood is Mikees! Hope ya'll have a great time and Harper is just too cute!!!!!!! Thanks for the restaurant idea! We are celebrating our 7th anniversary this weekend and looking for a new place to try. I don't like seafood, but we had to go to the Crab Shack (Orange Beach area I think) twice on our trip because everyone else loved it. LULU's is the best but I recomend going at lunch or early dinner....it gets way crowded. The food is WONDERFUL! Its definetely a touristy place but stillhas great food and the atmosphere is fun. Also the Hangout is fun, i wouldnt say you go for the food but the atmospere again is great! we LOVE the Original Oyster House! Bayside Grill is another favorite! Desoto's is good for lunch... and we like Tacky Jack's for breakfast! Can you tell we go there every single year! we are going in October and I can't wait! We will be in Orange Beach/Gulf Shores in 11 days!!! You can never go wrong with the Original Oyster House. King Neptunes is really good too. We go to Sea N Suds each year. We love their cheeseburgers. I have heard a lot of good things about the Hangout too. Live Bait is good, but loud. Have fun! Hey Kelly! Lulu's is a must (a fun, open and airy restaurant, it is owned by Jimmy Buffet's sister, The Wharf, Lambert's (in Foley, very good Southern food and "Home of the Throwed Rolls") also, Sea and Suds, it sits right on the beach on a pier! Have fun in my home state of Alabama!! Doc's is a must! And if you like a big breakfast, Tacky Jacks!!! Love the side-by-side pics! Hey there...We just got back from Orange Beach Sunday. If you liek breakfast food Tacky Jack's is a must. It is on the back bay in Orange Beach on the water. We always have to go to Louisiana Lagniappe for supper in San Roc Cay..DELIOUS! This year we went to Cobalt. It is next to the Caribe. Such great food and AWESOME atmosphere. It is on the water...there is an outside bar with band. While you wait you can listen to the music. Have fun!!! The Sunset Cork Room is incredible! I went there last year. EVERYTHING is delicious from beginning to end. I'd say moderately priced; not too expensive. You'll be glad you went! She does look just like her daddy! So cute!! But I think as she gets older, she'll develop some of your traits too. I live in Mobile, AL - just about 40 minutes away from Gulf Shores. My husband & I drive over there about 5-6 times/year for our date ngihts - we eat dinner (alone) and then take a walk on the beach - very romantic! You HAVE to eat at Lulu's and Original Oyster House. Just remember, if you go on a weekend, you could wait as long as 2 hours at either place (very popular). If you have any other questions, feel free to email me at sportsmomof123@gmail.com. I moved about 12 hours away for about 4 years & I hated it - I couldn't stand not being able to get out of bed & decide to go to beach for the day! I LOVE living here (hurricanes & all) :-)! Hey Kelly! I Heart Gulf Shores!! You will have so much fun!!! Definitely try 'The Hangout'. I have never been to lulus, but was told it is very similiar to the Hangout but the food is better at the hangout. If you like fried shrimp get the Shaka Shaka wrap....delicious!!!! Go around 5pm and you will totally miss the crowds...even on a Friday night! ;) 'Scoops' is fun for ice cream! :) Have a great trip! LuLu's is for fun not for the food. I also recommend Lambert's on your way to the outlets. :) A local dive (that is great) is Papa Rocco's. They have great pizza and Royal Red Shrimp. Also, if you get a chance ride the ferry from Fort Morgan to Dauphin Island. OOps just read some comments and alot of people are saying the opposite of what I said. I guess it is just all a matter of personal taste. I don't think you can go wrong on either rest. Have a great trip! YOU MUST GO TO THE ORIGINAL OYSTER HOUSE. IT IS BY FAR OUR FAVORITE WHEN THERE. WE OFTEN EACH THERE MORE THAN 1 TIME. MY FAVORITE IS THE CRAB CLAWS AND THEIR SALAD BAR IS WONDERFUL. please don't forget about your recipe blog! Hi Kelly - Harper is an absolute cutie pie! My husband and I are expecting our first child, a baby boy (Cooper Reece), in November and I LOVE reading your blog every morning! It's so nice to be able to read what other new moms go through and what I can soon expect! We live in Birmingham and we go to Gulf Shores at least once a year. Our favorite restaurants are Wolf Bay (great seafood and steaks- the original restaurant burned down a few year's ago and they reopened in Orange Beach at Zeke's Landing), The Original Oyster House (great seafood and their peanut butter chocolate chip pie is to DIE for! There are also some shops next door so you can shop while you wait for a table.) & King Neptune's (this looks like a little hole-in-the-wall but they have excellent gumbo and seafood bisque). For breakfast, you HAVE to go to Big O's and get one of their famous cinnamon rolls. They are huge and the best that we have ever had. Lulu's has great atmosphere but we weren't very impressed with the food. Sea and Suds is nice because you can sit outside and watch the waves. They have a small menu but the food is consistently good. Bahama Bob's is another nice beachside restaurant with good seafood. There are so many restaurants in that area that the possibilities are endless! I hope that y'all have a safe and fun trip! Louisiana Lagniappe for sure!!! Our very favorite spot - and it's kid friendly! Have fun! We are going to Orange Beach in September. We are staying at Phoenix West which is the newest Phoenix on the beach with a LAZY River which I am so excited about for my son who is 8. We have eaten at LuLu's which is so much fun. It's outdoor covered seating with a fun band playing every night. The kids like to get up and dance. We also ate at Hang Out last year. I didn't love it, and thought it was way overpriced! Lambert's is also good. It is right next to the outlet mall, so it's good to eat there if you are headed to Foley to the outlets! We also love Grazie which is Italian. We always ate there in Destin, but there is one in Orange Beach now. They have the BEST cheesecake! Have fun! TOO CUTE!!!! I was reading some of your comments and the lady gave advise on the baby powder and sand. I'm going to write that one down; that's a great little remedy. Hope your family has fun! Enjoy your MOPS group I love mine we just started are second year. We have lots of playdates and moms nights out and lots of food and fellowship and just other mom to talk to out there to know that we are not alone out there in this mothering adventure.